History – We wish to search and pass historical information, to try to link up to the future in a digital area, that way preserving and applying new found data in an effort to complied history’s unspoken answers. Respect – We cannot pay more tribute to them who have fallen, than to pay respect for them. In our research, we always respect the family's wishes and also the privacy of those who are left behind. Remembrance - We wish to ensure that the people who fell, military and civilian are never forgotten. There for, each year, we lay a wreath at the monument of a crashed Lancaster. Education – We support initiatives as; school projects and private quests, enabling us to understand the reasons for the freedom we have today and look to the future in a positive manner. Future generations must be reminded of what happened in WWII so that they never forget that their freedom was gained by acts and sacrifices of these men and women in history. New pictures – New faces. Y's 'Owells Emblem to the RAF Witchford Display of Memorobilia. All info and photos relating 115 Sqn during WW II are welcome, mail them to Filip Doms, the team thanks you for your effort. 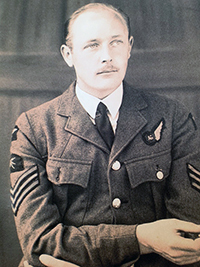 "Robert Ryland Reid was born on 24th May, 1914 to Frederick Reid and his first wife Agnes Jane Kimbrey (known as Daisy). He had a younger brother Brian HenryNeville Reid who was born in Janunary 1923. I believe he was also in the RAF but I am not certain. I do not known if Robert was married". Robert Reid and his crew members crashed with Lancaster Mk II - DS655 KO-W on 27/28 May 1943 on a mission to Essen, Germany. F/O Williams David – age ? On that night 23 aircraft were lost - 11 Halifaxes, 6 Lancasters, 5 Wellingtons, 1 Mosquito. Andrew Barrie sent on 04/02/2019 two photos for the Roll of Honour, thanks. Lost without trace. Now remembered on the Runnymede Memorial. Who can help us with photos of, Sgt Rutson, Sgt Greener and Sgt Constable ? In 2010 my sister and I went to France to meet a historian who was interested in the Lancaster that crashed in his area in June 1943. He showed us the field where it landed and was told they still dig up pieces of the plane from time to time. We met the interpreter of the resistance who was 90, his identity was changed to Felix Branger, he was 23 at the time. He spoke to us in English and even said he remembered our Dad when shown a picture. We were shown the derelict farmhouse where my Dad was taken when the farmer found him. It was the son of Monsieur Voisine who gave my fathers flying boots to the historian a few years before we met. He gave them to us and they are now in the Tangmere museum in the bomber command area. Graham Sturrock send (21/01/2019) us a photo from F/O Pusey Frederick Ronald Charles. 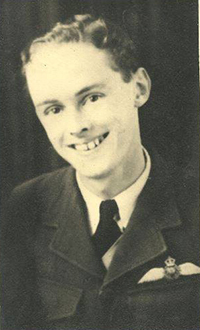 He was the brother of his mum Diana Margaret Sturrock (maiden name Pusey, born 14/1/1925 - died 24/8/2011). 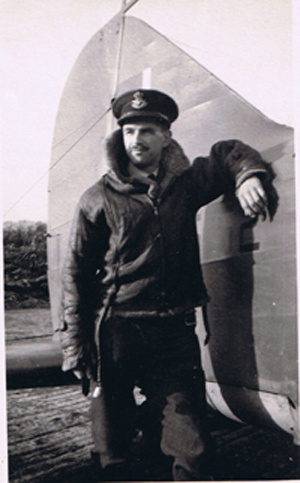 F/O Pusey was one of a small number of RAF personnel entitled to wear both RAF and USAF wings (see photo) as he trained in the US and then stayed to train both RAF and USAF pilots hence he had to have his American qualification and earned there wings as well. 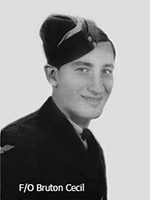 He and his crew crashed on their 3rd operation at Denmark, after a raid on Peenemunde. There were never found and are remembered on the Runnymede Memorial. (Message 16 January 2019) I would like to report that my cousin George Desmond Sherwood Perry - dob 11.5.24 - known as Dessie or Desmond died last week aged 94. He was a lovely man, and managed to live fairly independently until about 9 months ago when he went into a care home. 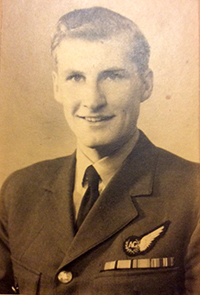 He was very modest, and although we knew he was a rear gunner in Lancaster's who was involved in ops over the Ruhr. He was very reluctant to talk about this in any detail, and would change the subject very quickly if we discussed it with him. I have found his log book, which makes fascinating reading, along with several photos copies of which I am sending to you. 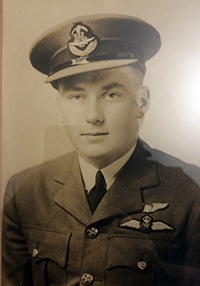 He started his air gunners trainings in Feb 1944, and this was followed by flight training and exercises until he started ops in October 44, including the flight over Cologne on October 30, when I believe many planes were lost. His last flight was Dec 27th 44. His tour ended on 19.1.45. In total he did 24 ops and survived unscathed, which is amazing considering how vulnerable gunners were in the belly of the plane. After the war he returned to run the family motor trade business in Paignton Devon, but went on to take his private pilots licence in the 1950s, I believe he stopped flying in 1970. His funeral is on 30.1.19 at 2:45, at Torquay Crematorium, an RAF standard bearded will be present. 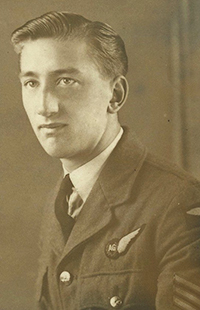 Sgt Cornett F. - Flt. Eng. The following articles and pictures on the website have all been written and supplied by my father and are all copyright to me as from 2008 when he passed away. I convinced him that his stories should be shown to keep the history alive. These are a few of the many memories that he has. I will add to this menu page as time permits. 115 Squadron Roll of Honour. A total of 163 pages plus Glossary of terms used together with a Table of Contents which lists all names and all aircraft for easy reference. There are also reproductions of 24 photographs each with an explanation. The cost of the publication is £30.00 plus £4.50 postage and packing in UK. Unfortunately I DO NOT NOW SEND ABROAD as postage is prohibitive. I would have to charge over £10.00. All profits from the Roll of Honour go to the Royal Air Force Benevolent Fund. I HAVE NO MORE COPIES LEFT. THE NEXT PUBLICATION WILL BE WHEN I CAN FIND A PUBLISHER WHO CAN DO A REASONABLE DEAL SO THAT I DO NOT HAVE TO INCREASE THE PRICE, SORRY FOR ANY INCONVENIENCE THIS MAY CAUSE. Who can help?